What’s new in The Big Kurma House? Well my latest sourdough loaves are the best ever. I added flax seeds and they seem to have created some special magic, texture wise. 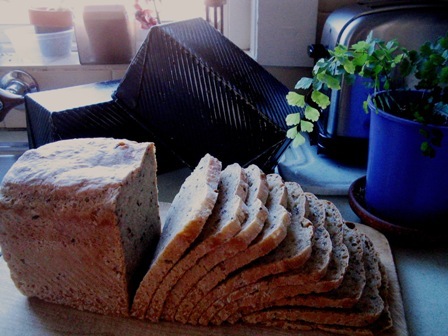 Honestly, it just amazes me how easy this bread is to make, and how delicious it turns out, every time. Moist, spongy, chewy, but firm, all at once. And toasted? The best! And all it contains is just flour, salt, water, and starter; nothing more, except the flax seeds. And what’s a man to do when he really doesn’t know what to cook for dinner? Reach for Kurma’s cookbook of course! Well, that’s ok if you’re not Kurma. As far as I am concerned, I check out what I have and cook whatever I feel inspired to eat. If you feel good about what you’ve cooked, it will digest perfectly well. I cut a decent-sized purple-skinned sweet potato into large chunks, and put them in a foil wrapper, then steamed/roasted it in the oven. If the foil wrap is very loose but airtight, the vegetables cook beautifully. Beetroot turns out amazing. 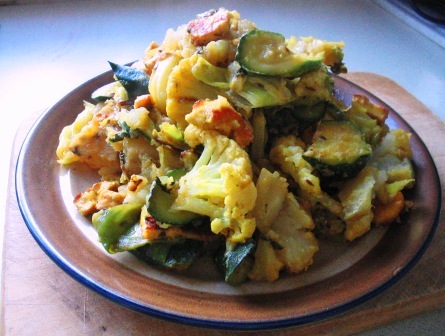 Meanwhile I heated a wok and splashed in some olive oil, threw in some fresh green chili and a little shredded fresh ginger, a smidge of asafetida and a sprinkle of cumin seeds, then some decent-sized chunks of cauliflower, savoy cabbage and zucchini. A quick stir, then I splashed in a little water, and put a tight lid on top. Then I took some slices of homemade organic panir cheese I had in the fridge and pan-fried them until golden-brown. When the vegies were just tender, I threw in some fresh tomato, a little bit of parsley and mint from my garden, a sprinkle of salt, a micro-mist of raw cane sugar, the crispy cooked panir and the already-tender sweet potato. No evictions tonight.